I've got this question about Shaklee's Resveratrol Anti-Aging Tonic more than once, so here is your answer straight from Shaklee's Field Communication Staff. The primary polyphenol source in the Kosher Polyphenol blend is pomegranate, rather than muscadine grape as contained in Vivix. 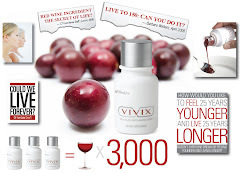 Both product formulations contain 100 mg of 98% pure resveratrol, as well as a significant level of additional non-resveratrol polyphenols from the Rejuvetrol or Kosher Polyphenol blends. In laboratory studies, the ingredients in both Vivix and Kosher Vivix have been shown to impact key mechanisms of cellular aging. Due to processing issues, we have not been able to create a kosher Vivix formulation that contains the muscadine grape, a nonkosher ingredient. In accordance with kosher law, a rabbi would need to be present during all of the various stages of production, including the pressing of the grapes at harvest. This timescale, along with the complexity of the specific production processes needed, precludes offering a kosher product that includes the muscadine grape. consult with their doctor about diet, sorbitol is slowly metabolized and would not be expected to significantly affect blood sugar levels. It can be used as an alternative to sugar by diabetics on the advice of their health care provider.